Keynote speaker Fab Dolan (Google Canada) embodied the speed of living and working in an exponentially changing, technological world with a brand new title (“Gingerbread Inc.: Keeping Pace in the Next Era of Business”). At the first IBAA hackathon, three teams invented new broker-focused technology in just 24 hours (“you can’t catch me”). Seminars raised current and emergent issues (the North American economic outlook, cybercrime, broker success with digital markets, Alberta auto concerns, and the effect of climate change on capital markets) while members engaged in intelligent discussion of pressing issues at the broker Town Hall. 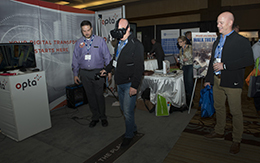 Virtual reality was one hit at the trade show, which buzzed with conversation. We feasted throughout, and danced and networked at hospitality night. To crown it all, IBAA’s new board and president Gerry Baert took command at the “starry night” gala that also kicked off our charity fundraising campaign for Ronald McDonald House and raised over $8,300 on the spot. Congratulations to the team at Sharp Mobile Technology, who won the first IBAA Hackathon! Read more. Did you have your photo taken courtesy of Swiss Re at hospitality night? Download a digital copy for online use or personal printing. Once on the Google sharing site, click the image you want and then click the "more options" dots to download. Welcome IBAA President Gerry Baert, President Elect Paul VanderHooft, Vice President Tim Gassner, Past President Julia Marshall, and all the other new and returning directors at large and local council chairs! Brokers and insurance company partners mingled throughout the convention and especially at the Peace Hills kickoff party, the trade show, hospitality night, the president's gala, and the golf tournament. Roger Marcelo (aka Michael Jackson) from RSA and Barry Haggis from Young & Haggis brought convention's theme of the future into their dance off as they began their dance off with children who attended the convention. IBAA member John Lee also shared his photos of convention. Thanks John! What a beautiful but chilly day at the Fairmont Banff Springs Golf Course. With a breathtaking view in all directions, the course is captivating and challenging. The optical illusions created by the mountains towering overhead can deceive the eye of even the most skilled player. Golfers raised $1,440 for the Women in Insurance Cancer Crusade (WICC)! Save the Date for IBAA's 2018 convention on May 6–9 at the Fairmont Banff Springs! Network with insurance brokers, insurance industry partners, and regulators! Attend insurance education sessions. Welcome IBAA's incoming president. Connect with Insurance Brokers Association of Canada and IBAA board members and staff. Where else do you get the chance to meet with some of the best minds in the industry? For any questions, concerns, or additional information regarding the 2017 or future conventions, please contact Margaret Buhay at convention@ibaa.ca, Tel. 780-569-5121.